The drought here seems unending and the weather-folk are far too excited about breaking all previously-recorded strings of days-in-a-row-over-100F. Me, not so much, but I am looking at my car in a slightly different light at the moment. Yup, I said “car”. Read on, this is not actually as much of a non sequitur as it first appears. Wait, first I have to tell you that I found something at the farmer’s market last week that I had never seen before. Fresh dates. Oh my! Fresh figs, certainly, although the season is just about over, but I had never seen dates other than the grocery-store dried ones that seem to keep forever. I love them, and I buy a few from time to time as a treat, but I had never seen anything like this. I didn’t even know what they were, all tidy in their little pint baskets. Adorable and intriguing! As soon as I got home I looked them up. I was astonished to discover that this was the second time in just a few weeks that I was face to face with the same new-to-me fruit, but in completely different iterations! The first time, a few weeks ago I was given a roll of “fruit leather” from the giant Chinese market. Here was the fresh version, on my kitchen table! 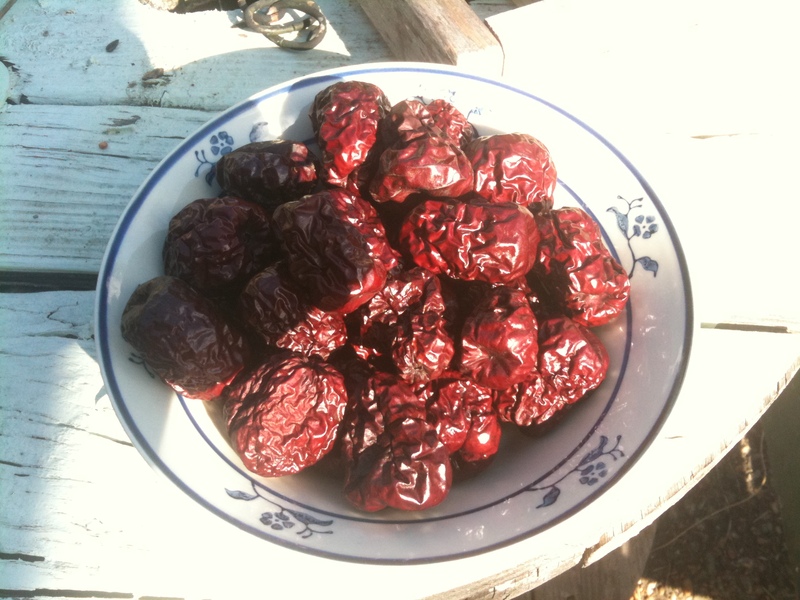 Jujube dates aka Chinese dates or Chinese haw are not true dates, but Wikipedia says they are good to eat both in their fresh and dried forms, and have an array of medicinal uses. My concern was preserving them, as I was pretty sure that I wouldn’t get around to eating them all in just a few days, and I sure don’t like to waste anything, as you know. Here’s the “car” part. I put the dates on cooling racks and set the racks on a cookie sheet and put the cookie sheet on my dashboard, closed the car windows all but a tiny crack, and waited. Lucky for me the dashboard in my car is flat enough to support the cookie sheet, and since there is no shade in my drive the dates got good sun for about nine hours the first day. I didn’t think to put a thermometer in the car, but I can tell you it was hot… hot enough that I couldn’t touch the cookie sheet without an oven mitt! And, the car smelled slightly caramel-y and divine! Since I’d never tried this before I wasn’t sure 1) if it would work 2) how long it might take or 3) if it was even a good idea. It worked fine, took about 4 days (and nights), and the final product seems to be one that will last as long as I let them! The most astonishing visible changes happened that first day. They went from greeny-brown and plump with a sort of matte skin to solid brown, wrinkled and shiny. Fascinating! And they became much lighter in weight. That might seem obvious, but I hadn’t thought about it. The whole process took, as I mentioned, about 4 days. I left them in the car for 5 days and nights, but there didn’t seem to be any difference after day 4. They are light as a feather, shiny, hard as rocks, and bear little resemblance to the dense crunchy apple-like dates I bought last weekend. The final product looks and feels like it will keep on the counter without refrigeration or any sort of fuss. I feel certain that I will need to reconstitute them for use in baking, but they are slightly chewy and almost toffee-like, sweet as all get-out, and great for snacking. I’m happy! I’m also harvesting the seeds as I eat the fruit, just in case I can get one or two to sprout. I understand that they do not always breed true, but I have enough yard to give it a shot! 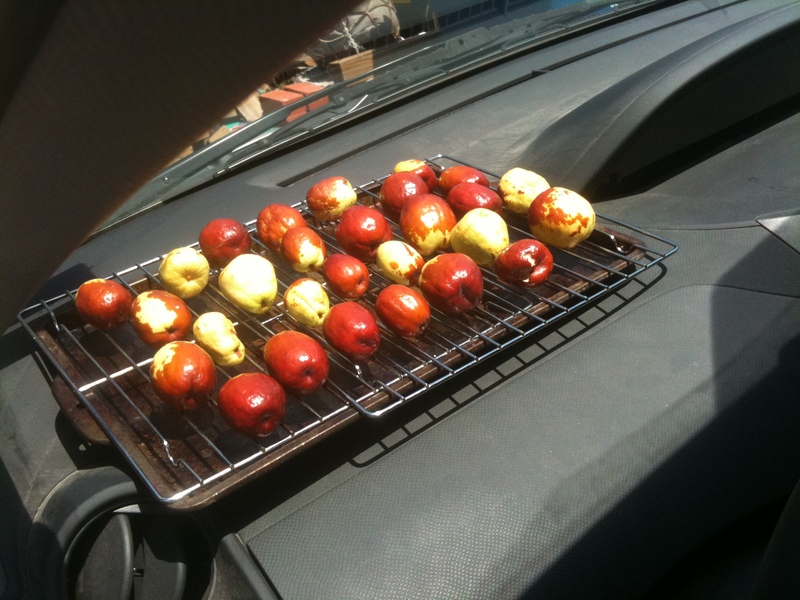 Caveat: I am not recommending that you use your vehicle as a dehydrator. It worked for me this time, but YMMV! good to know. but have you tried it with tomatoes yet? What a lucky find, and a great idea to dry them in the car. 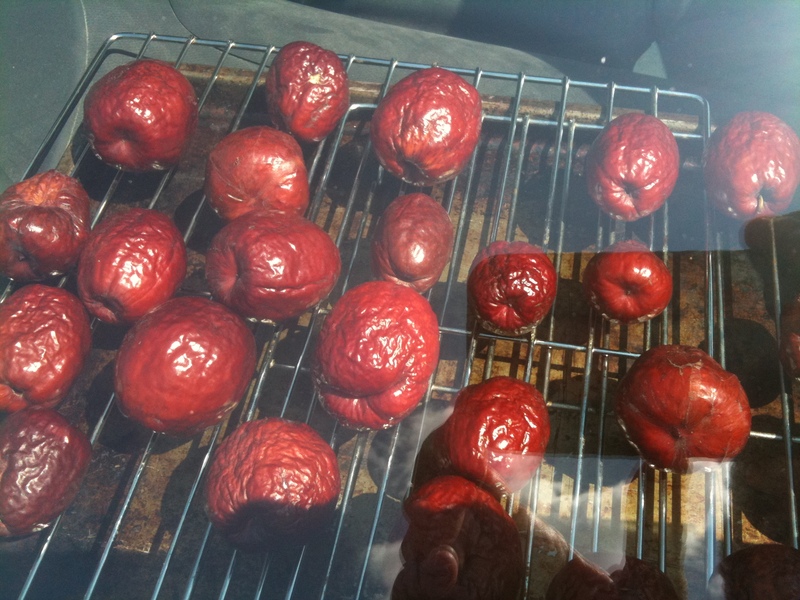 We once tried sun-drying tomatoes this way but ran out of patience…or needed to use the car! I may just try tomatoes next. Did you do yours sliced? I have some little “grape” tomatoes that I thought I would halve… we’ll see! Oh the old cooking on the dashboard trick. Fresh dates sound amazing. They were amazing! I hope to find more some time (seems this year’s season is over already). If you *ever* see ’em, grab you some! That’s one of the most extraordinary posts that I have ever read – great story. I can’t imagine continual heat like that – that comes from having spent a great deal of my life in the blazing summers of England!